I am a Christian with a desire to see as many souls as possible come to know Jesus Christ as their personal saviour before the "Day of God's Judgment". I downloaded the Is Jesus real tract and I cannot figure out how to fold it can you please e-mail me instructions on how to fold it at the e-mail address below. Thank you so much for giving us opertunities to share the Gospel. I like the way you have done your website. Hi Wesley, Thanks for using our website…..Firstly there are two tracts per A4 size paper. There is a dotted line across the middle of the printed page.This line is a guideline to cut the tracts apart.Next, fold the two tracts to look like booklets. 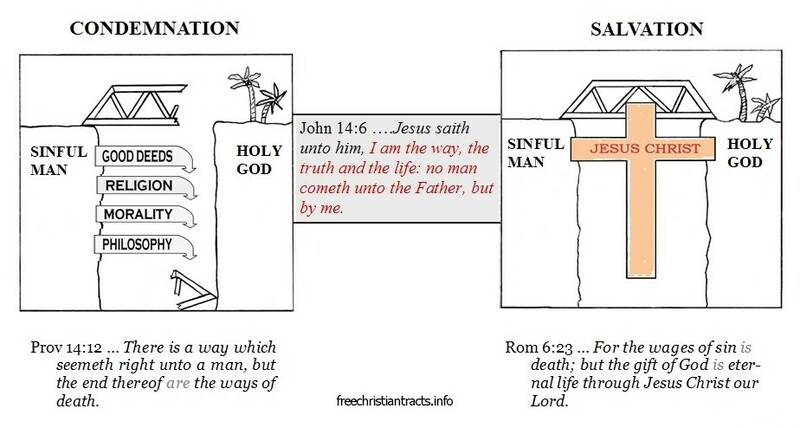 Most of our tracts can be printed to use this way. Another hint is if you want to print more than a few tracts at a time, it might be cheaper to have them printed at a local printing shop instead of using a home printer….. If you have further trouble please contact me again…. I hope these tracts will help you bring much glory to God….., Blessings to you, Brother Pete. I am very thankful to see a brother doing such a good work as this. I myself am a Pastor and an evangelist, and as such i am always on the look our for tracts that can be printed from home, especially those quoting from the Authorized Version. (I too believe that there is no closer rendering to be produced in the English language than that which was produced under King James I.
I do however have one question. My church, in the course of its evangelical outreach likes to leave our name and contact info with those we witness to. I would like to know if u would have any problem with a church adding its name, address, and a contact number to a blank area of your tracts, (providing your web info and reference links and all other original text u have placed remains visible, in tact, and legible)? pasting the desired info onto a blank margin somewhere. I would only do this with your express permission however, as these tracts are clearly a labor of love that you have put a great deal of work and prayer into. I look forward to hearing back from you, thank you for your time and God bless you and your work. Thanks so much for the encouragement for my tract ministry. I don’t have a problem with you putting your church info onto the tracts or any of the images that I have uploaded. The only thing on the tracts is that I do not want the doctrinal messages changed. Otherwise, go ahead with my blessings on this matter. I am the webmaster for freechristiantracts.info and freechristiantracts4u. A bit over 50% of the tracts are my creation and also all of the graphics and articles. The other tracts are written by a couple of friends of mine. If you have any doubts about anything please contact me.